This list was provided by the good old Chief Kryder... mine has not worked out so far so lets get this discussion going. 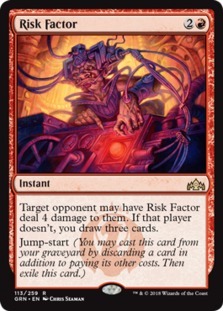 Control the board with Cheap removal and then cast a huge Explosion, draw a bunch of cards and do it again next turn. Thoughts about Fight with Fire in that list? 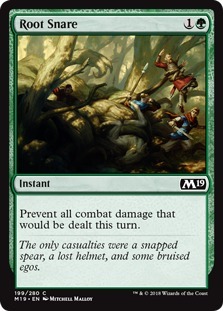 Can act as an acceptable early-game removal spell and can act as a 20 to the dome with 11 mana mainphase (copy w Expansion // Explosion) or 13 in your end step (Electrodominance for X=3, cast FwF, pay kicker, copy with E/E). 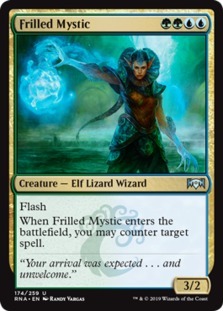 Also, The Mirari Conjecture seems like an interesting 1-of in this list, especially if running the FwF combo. I guess we need to test it to be sure. 1) What's with all the Shivan Fires and Shocks? Do you really need that much cheap removal? 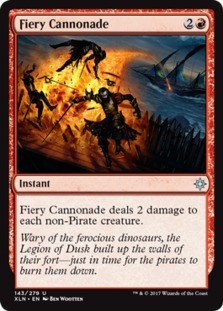 2) No sweepers (Fiery Cannonade)? 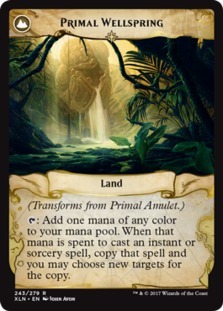 3) Surprising the mana base isn't all dual lands. 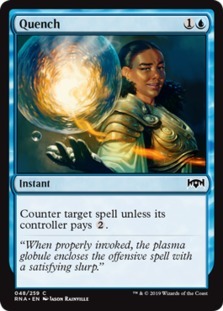 4) No card advantage spells (Chemister's Insight)? It's a Niv deck, so it wants lots of 1 mana spells to take advantage of him. Normally they run some number of Dive Down too, I'd be tempted to drop Star an Expansion and a cannonade for 3 of those. Maybe go for some cheaper draw as well - Chart a course maybe. Hard to say without playing it lots and comparing it to Niv Drakes. So spiral is just amazing... its just silly not to play it... it ramps you and it draws you a card, Shimmer is amazing good, cheap and lets you dig. Unconfortable Chill so we use Nexus but this is as near as playing with Fog that I will ever get. Precognitive perception, very solid cast it main phase with Wilderness and dig... 5 CMC is a lot but I think the card is good... I´m not sold for play set but maybe 2 copies and 2 Chemister is the right split. 1. Overall I think it was a mistake to run cheap removals, the deck really just wants to take off and for that you need to draw your cards and find your Wilderness reclamation. 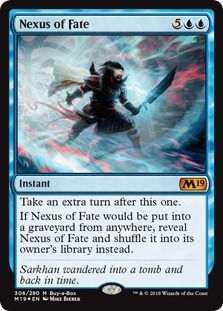 The deck can win on the spot if you chain a couple Nexus of fate... and this thing can produce absurd amounts of mana. 2. Same as before... the one reactive card is Uncomfortable chill and that is only good because it lets you keep digging. 3. Exp/exp is the best but I´m also running a combination of Chemisters and Precognitive perception, I think both are very important Chemister lets you discard excess lands and it comes online with Wilderness... Precognitive, its a power house T5 with Wilderness back up. The deck is super fun to play... but it requires some skill for manually tapping mana... and ALWAYS .... ALWAYS put a stop on your end step. Maybe consider Primal Amulet - Primal Wellspring with all your draw and wanting to chain Nexus. Dude I don't know how to play this deck. It gets killed long before I can set anything up. Its not an easy deck to pilot but it can be very fast IME. Ok so... I had the felling you were right and it turns out you were! I´m still away from being able to cast it... 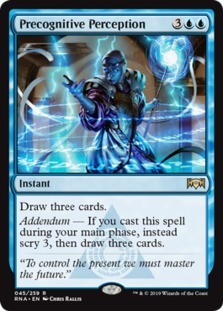 I dunno if you cast Electro for 10 you can cast a kicked FWF or you have to cast Electro for 3+ and then save 6cmc to pay for the Kicker cost of FWF. 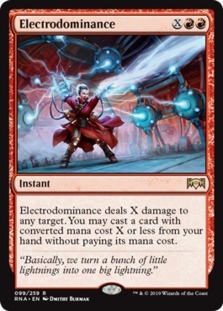 EDIT: Paying X=9 with Electrodominance to cast a kicked FWF does not work, you can however cast x=+3 with Electrodominance and leave 6cmc to pay the kicker cost as you cast the spell. CONFIRMED. This is my current build, I chopped those sissy peseudo Fogs.... and went more all in... at this point is hard to justify almost anything. Man I need this semi layoff to finish (it's really only the weather holding me back now... cold as F and none of my jobs want to run today) so I can spend a few more bucks on the game. 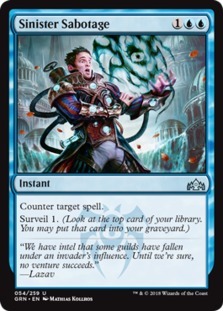 I would love to build this and finish my Mass Manipulation deck. Glad to hear the Amulet is working good for you. I'm not normally the greatest at evaluation as I never learn all the cards in a set by heart so I can refer to them on a whim but I remembered that card and thought it would fit your deck perfectly. Here are a couple versions of this deck that went 5-0 in MTGO Competative Standard League this week. This is the deck... and I think its really close to the bones, I just took it to FNM and lost on the final ... against RDW by Crazy Razor 2-1, also took it to a Quick constructed event went 7-1, next I will test it on B03... the sideboard is basically change the Root snares for Negates if you are playing against control... that is the one concession the deck makes. Finally the deck does want **** fog... its the card that lets you Dodge lethal. Ideally you have Wilderness or Primal Amulet on your opening hand. 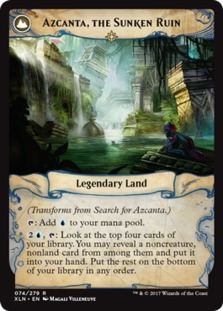 This is what will make you survive or take a little edge in the begging of the game, Search for Azcanta is awesome T2 try to land it before anything else, If you are below 4 lands always try to find what you need and dont be shy on ditching lands to the GY with all the card draw the deck has, you are going to be flooding more often than not. This is the core of the deck and having redundancy is what makes it work. 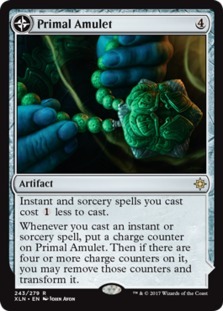 Wilderness doubles your mana... Primal Amulet doubles your spells... Together you can Kill your opponent on the spot or take a Bunch of turns. This is the engine that will allow you to flip Primal amulet... and cycle your hand when you are flooding, both are instant speed so you can use every drop of mana from wilderness activation. This are your win cons you can end up taking all the turns you want but to actually kill your opponent you are going to have to BURN them. This is just nasty... and when you are doing this its just a courtesy to end the match... coz your may be taking 2-3 turns for every time you cast your Nexus. 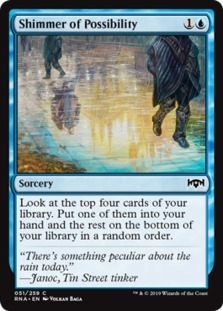 Once you flip your Search or your Amulet then Wilderness just becomes absurd... For each Wilderness you are getting an extra copy of your spell or looking an extra 4 lands deep. This is the Build.... I think I like it a bit more. This deck is a house... its very solid against the field, sure its can stumble against RDW and WW on G1 but probably G2 on the play can be devastating... G3 is slightly favored for the RDW but not so much for WW. 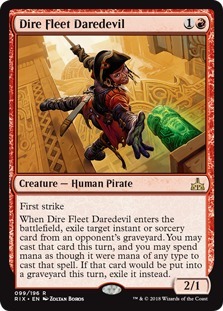 Esper is the most fun matchup... favored for us on G1 but do not remove your removal for G2 coz Thief of sanity will show up, here Dire Fleet Daredevil is amazing and can give a lot of advantage in the cheapest way. 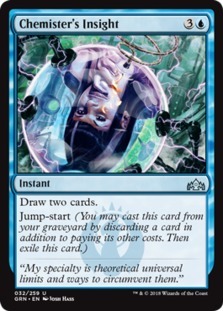 Growth spiral, sure a T3 Reclamation or T5 Niv is huge... but IMO this is a trap... same as Opt... if you are playing the combo approach then yes those cards are better but.. on a control shell you want answers or you are getting run over. Quench, solid on the early game... even better than syncopate... but after that is a dead card... and we do want to get to the late game.. so axe! 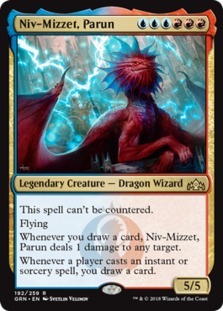 3 Niv-Mizzet, Parun / 3 is the right number Niv is the frigging boss and he is probably what makes this deck so fun to play, T6 Niv with Reclamation on board is just so good. 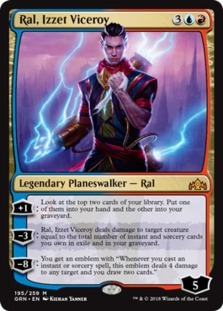 1 Ral, Izzet Viceroy/ one copy gives the deck edge against resolved fatties, also Ral is the fastest PW with a relevant ultimate, I love this guy and he has persistently showed me that he deserves a spot on standard. 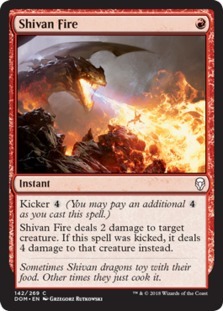 2 Shivan Fire, solid on the early game, versatile on the late game. 4 Syncopate, perfect match for this deck... amazing on your opener quite solid on the late game when you are sitting on a **** load of mana... amazing vs Kraxis and Nexus. 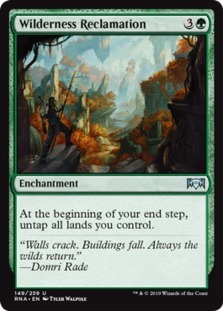 4 Wilderness Reclamation, best card in standard period // Remember to set end step pauses before spending your mana. MANUALLY TAP YOUR MANA FOR THIS! 2 Search for Azcanta, the next best thing to do with Reclamation... search for your answers! 2 Dire Fleet Daredevil, against black based control... particularly Esper and RDW... add a relevant blocker and burn something. 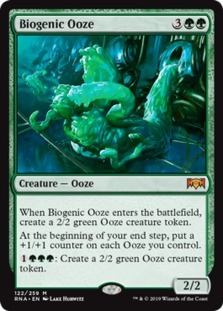 2 Biogenic Ooze, surprise surprise... this has been a fun one against mid-range and some control match ups on the play. Last edited by Cucho Lambreta on Wed Mar 06, 2019 7:11 am, edited 1 time in total. Either forgot or didn't notice you had this thread This is copied from the one I started (and deleted). - I don't know if this deck should run Nexus of Fate. 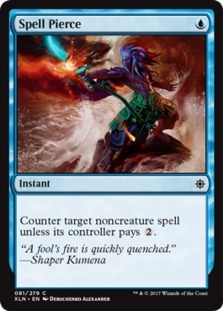 I see PV wrote an article about Temur Nexus here https://www.channelfireball.com/articles/temur-nexus/, but I haven't had the time to read it + try the archetype yet. The rest of these first impressions focus on the other version of Temur and the one played by Face to Face games, Temur Reclamation. - Boy is monored a bad matchup. - The deck is more a control deck than a combo deck. 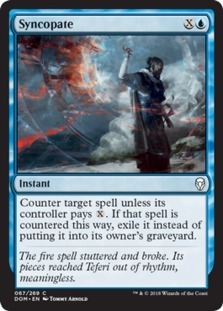 You run sweepers mainboard, as well as creature kill (Shivan Fire). 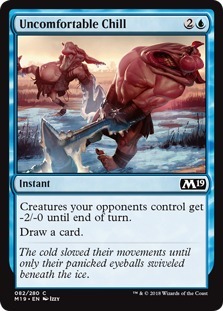 - Because of the sweepers mainboard as well as creature kill, the matchup against aggro decks doesn't seem so bad. - Control also seems like a good matchup. 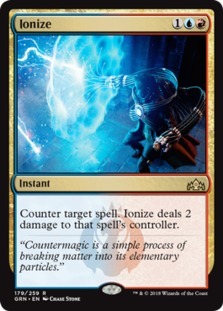 You have spells they have to counter or lose (Reclamation), you have maindeck counterspells to fight counter wars (Expansion//Explosion doubles as a counterspell), and Niv-Mizzet is uncounterable. If you both sit there and make land drops eventually you'll hit 15+ lands and play Niv-Mizzet, counter their removal, and win the game. That said, they do have Thought Erasure, which can seriously hurt this plan. 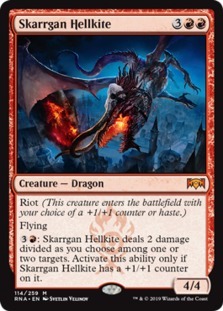 - Niv-Mizzet is a real house against some of the decks in the format. Resolve it and win, basically, especially if you get to untap. - Unlike Simic Nexus, this deck has game against monoblue with all the cheap removal + sweepers it runs. - Postboard the deck actually feels like a bastardized ramp deck. 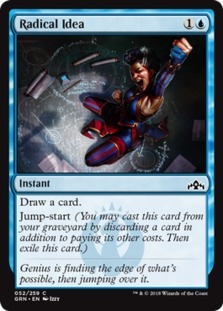 Growth Spiral is your only ramp spell, but still, the gameplan is the same as other ramp decks: you make your land drops, control the board with your removal, and then start casting Rekindling Phoenix, Biogenic Ooze, and Niv-Mizzet. 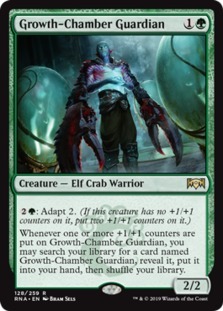 - Unlike Simic, the creature plan isn't so "transformational". With the Simic deck, after sideboard, you can remain a lean and efficient combo deck, or you can transform into a creature deck. With Temur, you don't have the "lean and efficient combo deck" angle, and you always change your plans postboard as a result. - The matchup against Simic Nexus is quite weird. 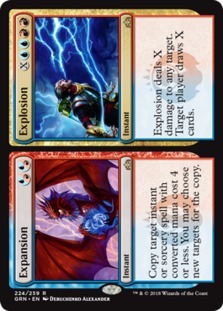 Resolve Niv-Mizzet and as long as you have more cards in your library than opponent has life points, their only out mainboard is Blink of an Eye. They only have so many Blinks too. If you can counter it they just die. 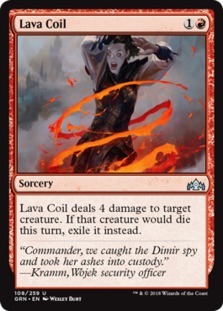 That said, since Niv-Mizzet's trigger is mandatory, drawing your entire deck is a significant danger. I almost decked out against a Bant list playing Revitalize. - Cindervines isn't so deadly against this deck, but it's still a lot of pain. 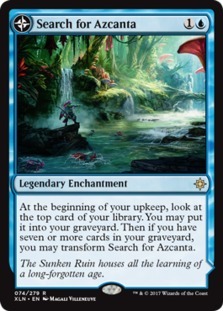 - It's surprising the standard lists aren't running 3x Search for Azcanta. - The deck is less miserable to play, but still painful. Having to cast Explosion for 22 is quite a lot of clicks. Is there a way to quickly tap lands like Breeding Pool if you don't care which color you get? What do you SB for the mirror and/or drakes? The shuffler hates me or something. I had to make some changes for consistencies sake. 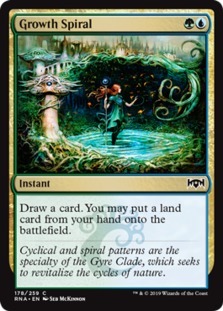 It's still not as consistent as Simic Nexus IMO.